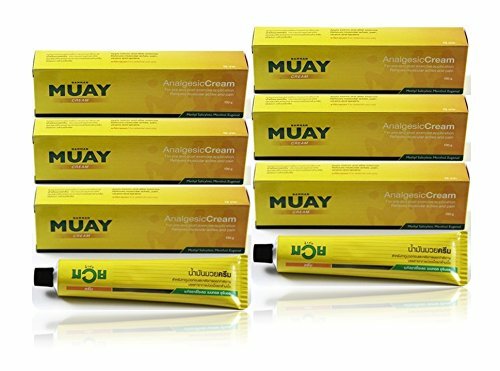 Thai Boxing Liniment is external analgesic pain reliever Namman Mauy has been specially formulated to be used for pre-sport warm up, to prevent muscle straining, spraining or injury during sport and for use as an after-sport or injury home care treatment. Namman Muay aids in maintaining consistency in training and strenuous activity by helping eliminate or reduce nagging aches and pains. Thailand as a sports oil , traditionally for the Muay-Thai Boxers. It's good for blood circulation, speedy recovery and the temporary relief of aches and pains that are usually associated with contact all sports,or any activity, overworked muscles,tendons, rheumatism and arthritis. Namman Muay is the only kind of liniment in Thailand that possesses these unique characteristics. The body will be ready for physical exertion after applying and rubbing the muscles with Namman Muay. If you have any questions about this product by Namman Muay, contact us by completing and submitting the form below. If you are looking for a specif part number, please include it with your message.